At the end of my trip to Can Tho and the Mekong Delta, still smiling from that spectacular bun rieu soup, I took a long bus back to Saigon, into Mien Tay, the Western bus station. Located about a 20 minute drive from District 1, it is inconvenient for most travelers — so the bus companies have provided shuttles to take their passengers from the outer reaches of the city into District 10. 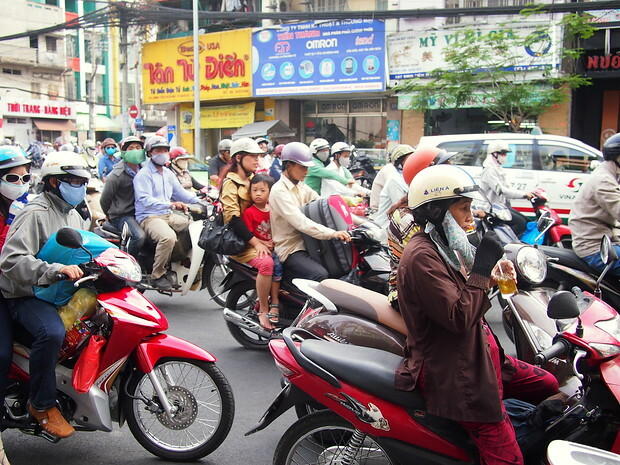 Climbing out of my shuttle, I was met by a teeming mass of motorcycle taxi drivers, called xe om in Vietnam. Laughing, I twisted sideways and sprung out of the bus to the right, temporarily out of reach. With only an overnight bag and a purse, I was more nimble than usual. To the dismay of the moto taxi drivers, I hopped into the bus company’s waiting room and office. This practice has become my usual strategy when coming off a long bus or train ride in Southeast Asia or South America. One of the more overwhelming aspects of arriving in a new city is the fact that you are greeted by a stunningly chaotic scene of transportation options, all wanting your attention. When that ride is a night bus or train it is even more intense, exhaustion eclipsing any patience, blotting it away. Making a beeline for an office or a store, even to ask a ridiculous question, tends to scatter many of the drivers and leave you with the more determined and calmer lot upon your return.